Instagram is an online mobile photo and video sharing website which enables its users to share photos and videos through a variety of social networking sites such as Facebook, Twitter, Tumblr and Flickr. Instagram uses instamatic and polaroid images. It allows users to apply digital filters to their images. Instagram allows short videos and it can show videos up to 15 seconds. Instagram is distributed through the Apple App Store, Google Play, and Windows Phone Store. Our developers have been implementing Instagram services for various web and software applications since it has been on trend. We have helped our clients by delivering applications to increase followers on Instagram thereby enabling them showcase their products and services. We are proficient in deploying new trends like Weekend Hashtag Project, Throwback Thursday and Selfies. We have also worked on developing applications for explore tab, filters, lux and video. We are mainly focussing on explore tab, filters, lux and video. Explore tab is used to find out people in Instagram. The search can be customized to a certain extent. The filters give different tone to the images. There are a variety of filters available. Our team can customize filters. Lux is used to edit Instagram photos for customizing. Videos can also be shared using Instagram and there are options to customize video sharing. We have worked on authentication, restricting API requests, real-time management, mobile sharing, API console, endpoints, limits, embedding, libraries etc. Our team has created several web as well as software applications for Instagram. We have developed applications to provide additional effects to Instagram photos, offering live feed of Instagram, giving additional photo album options, creating digital stabilized time lapse videos, calculating Instagram statistics of likes, shares and followers, printing Instagram photos, finding photos based on the location and providing over 100 effects, textures and frames. We also have hands on experience in developing web applications to increase the likes, shares and followers. You can easily search images from hashtags . 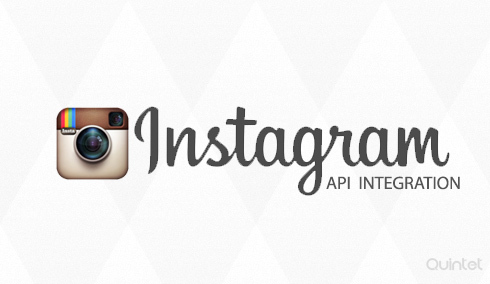 This is a basic function of the instagram API. Many apps and services rely very much on this operation. Using a tag search and having them update in real time on a website is very useful and this feature greatly benefits marketing campaigns. It is possible to integrate any particular company’s or individual’s Instagram photos or photo streams onto their business website. Using this function, users can create a gallery of images or have their photostream automatically update as new pictures are added. By using Instagram’s API to search for geotags, you can see what is trending in different parts of the world. Using the instagrams print api you can now easily print photos that you upload to your stream instantly. Business owners now are on the look out to find if their customers liked their products. A happy customer will take a picture on instagram and use hashtags. This will help to gather information about how his product is doing and how the customers are reacting to it, by using the api on your website. Now a days companies are trying to build up their instagram presence for the same reason. It has become a trend these days to show a live feed of the twitter or instagram status and pictures to an audience by searching for a specific hashtag name, on a screen. The instagram API integration is very useful for this. You can considerably increase your customer base integrating instagram APIs which will result in better profits and we are here to help to get this done. Pins are visual bookmarks for user interests. Pinterest is a site for storing and organizing these pins. Quintet offers pinterest integration with your website or mobile applications. Proper use of the pinterest api features increases your content viewers count and hence more publicity.